"Have you ever seen those ghosts that storm across the city streets? Those are the traces we leave behind when space-time collapses at chance moments. I have a few friends whom I never met in the real world. However, in the realm of memory, we have walked the same streets and arcades time and again. Every round or spiral pattern in the city is like a compass of time and space. Traversing here, we experience a day of everlasting reincarnation of this city." 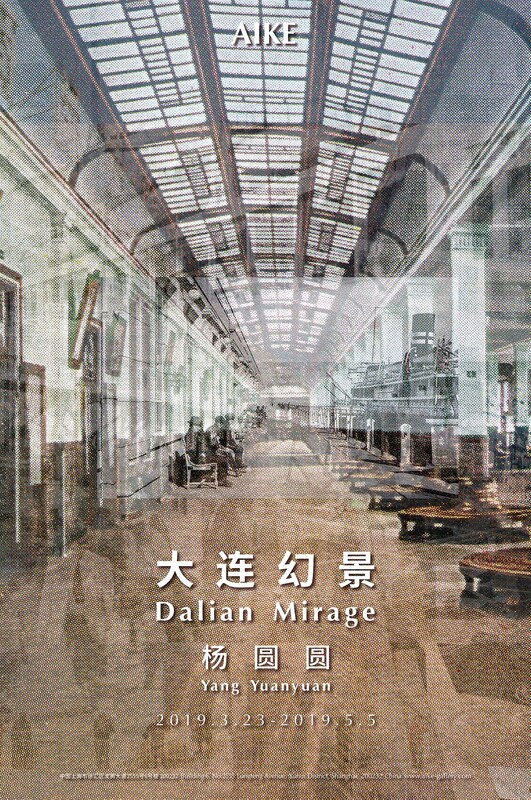 AIKE is delighted to present “Dalian Mirage”, a solo exhibition by Yang Yuanyuan. With Dalian's modern history as its background, a "seven-act" play is presented in a theatre set of the city through multiple media including photography, installation, video and sound. Characters of different times are passing through distinctive urban spaces such as harbour, staircase, square, hotel, street and theatre. 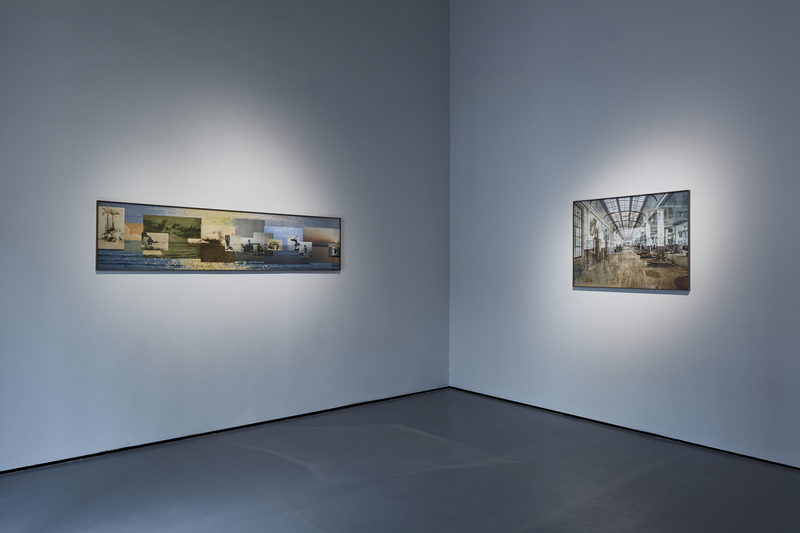 In the world of Dalian Mirage, the boundaries of times and nations have blurred, viewers could walk freely as if being within the parallel time and space of the past and the present. Among the fragmented monologues of various "foreigners", there is an unfathomable question that echoes throughout hundreds of years - "what is 'home'"? The exhibition will be on view from March 23, 2018 to May 5, 2019. This exhibition is first conceived from a series of photographs. The silhouettes in these images from the past awaited for careful identification, with which we may arrive at different destinations with the compass of time, and encounter with those people hidden within them, meanwhile, the functions and properties of the various urban spaces from different historical periods surface throughout this process. In this spatial montage Yang Yuanyuan has constructed, time and space overlap in various ways, even the fate of complete strangers seem to connect as they come into it, and discover the same sentimentalities and memories they have in common of the same city. Every moment from the past, a fragment of reality, constitutes the world at this moment. Stepping on the stairs to the central stage in the exhibition space and passing through the layers of curtains, one comes into the time theatre Yang Yuanyuan mounts: it opens with the monologue of a Japanese writer born in Dalian; a round public square shot at dawn gradually emerges into the various narratives of a few characters; the images then takes the viewer into the Yamato Hotel, an establishment has weathered hundreds of years history, under the blazing morning sun in Dalian; at noon, in the dining hall of the Yamato Hotel, the two clocks at the front seem to string multiple moments into a trance; the first building of this city meets the eye at noon; in the afternoon, a stroll through various streets; with the arrival of dusk, one comes to the Tokiwaza Theatre on Liansuo Street; looking out to the sea in darkness, one waits for dawn to arrive in the mirage at the Dalian port. Yang Yuanyuan hopes to take the viewers along with these ten characters of the play, to experience the city at different times of a day, that seem to merge into an endless cycle. Born in Beijing in 1989, Yang Yuanyuan currently works and lives in Beijing. Most of the time, her projects take the research and collected historical materials as the departure, and they evolve along with individual experiences relate to specific places. By creating narratives where facts and fiction coexist, she challenges the rigid and conventional interpretation of history and gives voices to subjects that have been forgotten, silenced, and misinterpreted. Yang creates visual narrative through photography, writings, video, artist books and performance, these mediums intertwine with each other within her projects. In the past few years, many of Yang Yuanyuan’s projects unfold upon the history of migration and war in the 20th century. Although the theme, location and period of the stories are different, they are subtlety related to each other. Her recent solo exhibitions include: ’Theater of Crossroads’ (Chinese American Arts Council Gallery 456, New York, 2018); ’Interval’ (Modern Art Base, Shanghai, 2018); ’At the Place of Crossed Sights’ (C-Space, Beijing, 2016); ’Nearly There, Nearly Concrete, Chongqing’ (Organhaus, Chongqing, 2014); ’In-between Places’ (Being 3 Gallery, Beijing, 2012). 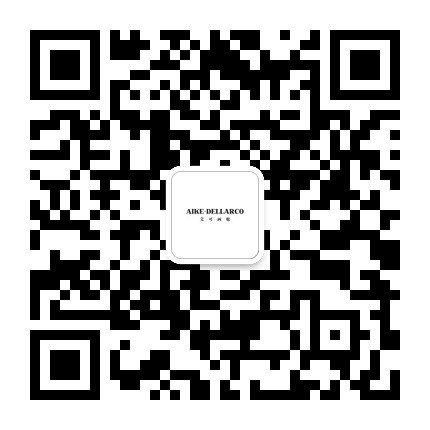 She has attended group exhibitions at OCAT Shenzhen (2018); K11 (Shenyang,2018); FM Centre (Milan, 2018); Three Shadows Photography Art Centre (Beijing, 2018); Guangzhou Image Triennial (2017); OCAT (Shanghai, 2017); Guangdong Times Museum (2017); Fotogalerie Wien (2016); Benaki Museum (Athens, 2015); Espacio de Arte Contemporáneo (Uruguay, 2015); Objectifs (Singapore, 2015). Yang Yuanyuan was the artist-in-residence at Art in General in New York in 2018, supported by Asian Cultural Council’s grant in 2017. She has also been shortlisted and awarded internationally, including New Talent Photography Award (2016), Huayu Youth Award (2016), Second Prize at Gucang Dummy Award Martin Parr Edition, Author Book Award at Rencontres d’Arles (2015), UK winner at Magenta: Flash Forward, Magenta Foundation (2013) and Third Prize at Bar Tur Photobook Award (2011).